This is a simple phonograph that you can build with some wood, and some old junk. This phonograph works much like orginal tinfoil phonographs, with the exception that it is a "linear phonograph". I like to call the model designed by me (this one) the "Horn" model phonograph. I have actually built this phonograph and it does work. 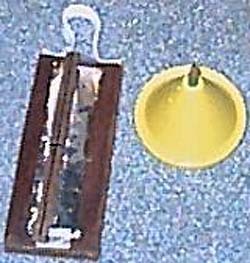 The main materials needed to build this phonograph are: One plywood board (6 in x 3 in; 1 in thick), one square wooden dowel (8 in x 1 cm), one sheet of felt cloth; any colour (6 1/2 in x 4 in), one small plastic cup or plastic cone, two wall tacks, and last one pencil. 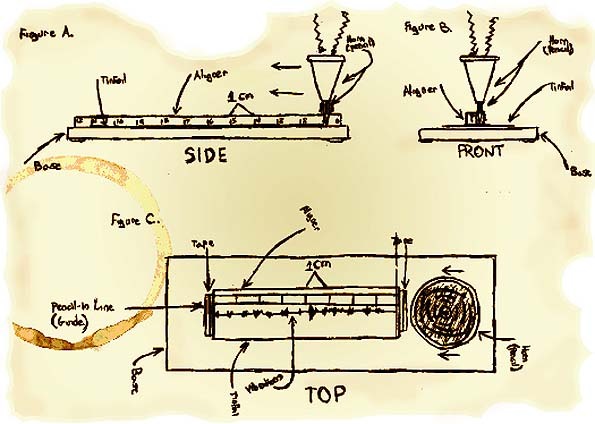 Here you can view the schematic of this phonograph, & below are the instructions on how to build/operate it. To build the base or, the "main body" of the phonograph, cut a 5 1/2 in x 2 1/3 in rectangle out of the board. Once cut out, sand it smooth starting with course sand paper, then fine. Once sanded, stain with wood stain if you so desire. Next cut a 5 1/2 x 2 1/3 out of the felt cloth sheet, glue to bottom of base with craft glue. Using the remaining felt cloth, cut out a strip 1/2 in x 4 in. Using the two tacks, make a handle by tacking each end of the cloth to the front edge of the base. Let base dry at least one day. To build the guide, cut the square wooden dowel to the length of the base and sand it smooth. Stain with wood stain if you desire as well. Using a knife, cut a hole in the bottom of the cup about the diameter of the pencil, once the pencil can fit into the hole snugly, you are done. Cut the pencil from the tip up to 2 in long, glue into the hole with the pencil tip facing out the cup. Glue the pencil in where there is 1 in of pencil outside the bottom of the cup. Let mouthpiece dry at least one day. Cut a strip of tinfoil 1 in x 3 in and tape to the center of the phonograph base on the edges of strip. Place the guide near center over the tinfoil strip. Place the mouthpiece at the bottom of the tinfoil strip, with the pencil standing straight up against the guide. While holding the guide down firmly, move the mouthpiece at a steady pace over the tinfoil strip; speak into the mouthpiece loudly if needed while doing so. Once end of strip is reached, do not move the guide, but place the mouthpiece back at the bottom of the tinfoil strip. Run the mouthpiece over the line and listen into the mouthpiece to hear the sound reproduced. Aluminum duct tape - never used it, but I hear it's the best recording foil you can use besides actual tinfoil. Heavy duty aluminum foil - I have tried to use it, have recorded but cannot play back any recordings. Regular aluminum foil - I have tried to use it, have recorded and played back recordings. This is the most inexpensive working recording foil I have used. Most problems that people have are caused by either not talking loud enough, not keeping a straight line, or pushing down too hard during playback.